Hundreds of supporters of influential Iraqi Shiite cleric Moqtada al-Sadr, who have been protesting against corruption, have stormed Baghdad’s Green Zone. The crowds entered the parliamentary building. A state of emergency has been declared in the Iraqi capital. To prevent more protesters entering the Green Zone, Iraqi security forces have fired tear gas and shot bullets into the air, Reuters reported citing its sources in the police, as well as al-Sadr's office. Around a dozen people were injured. To keep protesters from crossing a bridge near the US embassy, SWAT troops and presidential guard forces have been deployed, according to Reuters. A special forces unit with armored vehicles from the Iraqi army has been dispatched to protect sensitive sites in the area, while security personnel have joined forces with al-Sadr's militiamen to control the protesters' movements, the news agency reported. Earlier in the day, all entrances to Baghdad were shut "as a precautionary measure to maintain the capital's security," Reuters reported citing an unnamed security official. 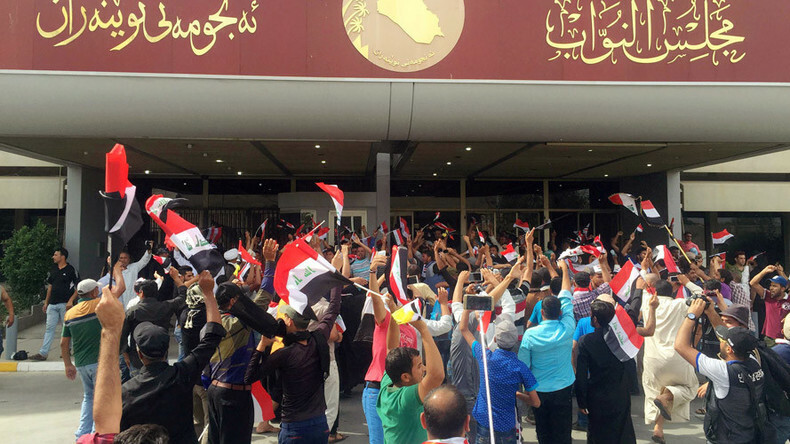 The demonstrators decided to break into a heavily fortified area, which holds government buildings and numerous foreign embassies after lawmakers failed to pass a vote on making changes to the current Iraqi government. Shouting “the cowards ran away,” in reference to the MPs who were leaving the parliament building, they managed to make their way into the Green Zone and subsequently into the parliament building. The demonstrators smashed glass and furniture, while another group set a vehicle on fire. Many of them later left the parliamentary building and had reportedly started preparing for a sit-in outside. While on their way to the parliamentary building, angry protesters damaged several vehicles, which they believed belonged to lawmakers, AFP reported. The UN mission for Iraq has released a statement saying it is "gravely concerned by today's developments in Baghdad." The Mission urged "calm, restraint and respect for Iraq's constitutional institutions," calling the situation in the country a "crucial juncture." A spokesman for the United Nations and four Western diplomats who were inside the Green Zone said their compounds were in lockdown. They denied reports that staff at the missions had been evacuated. No curfew has been imposed, according to two security officials who spoke to Reuters. A Kurdish MP is currently trapped inside the parliament building, the Rudaw news network reported. A guard at one of the checkpoints said the demonstrators had not been searched before entering the area, Reuters reports. The breach will come as an embarrassment to the Iraqi government: the protesters were able to get through what should have been a heavily secured area. The protesters were waving Iraqi flags and were chanting “peaceful, peaceful,” while others were standing on the outer wall of the Green Zone. There were thousands more demonstrators waiting outside the gates of the fortified area. Some protesters also headed in the direction of the PM's office building, the Rudaw news agency reported. Iraqi President Fuad Masum has called on the protesters to "calm down," Rudaw reported. 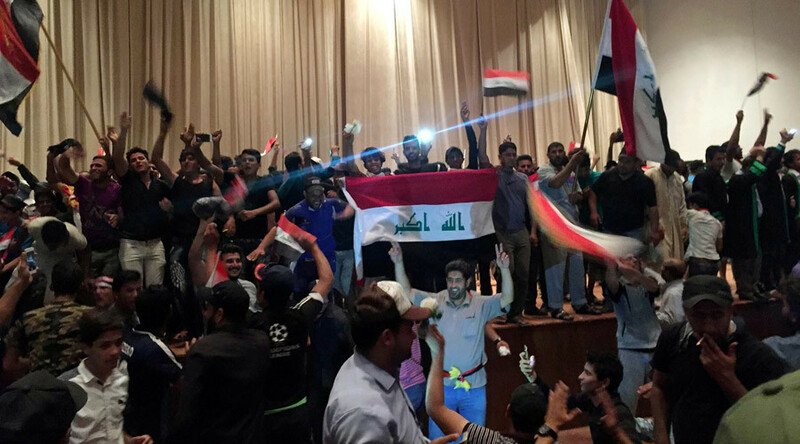 Some of the protesters subsequently left the parliament building having been instructed to do so by al-Sadr. Meanwhile, al-Sadr himself said that he could “destroy” Iraq’s government. “I am promising you that I will not make any agreements with other politicians. I work for the benefit of the nation,” Sadr said in a speech in the holy city of Najaf, as cited by Rudaw. “If the nation lets me I can end the current government and form a new one without any corruption,” he added. There are reports on social media that some of the protesters are heading towards Baghdad Airport in order to try and prevent the MPs from leaving the capital. The Russian Embassy in Baghdad continues to work as normal, a member of the diplomatic mission told RIA. “We are keeping an eye on how events are developing, especially around the parliament. However, the local press is reporting that the protests are peaceful in nature,” said Aleksandr Kozin, the first secretary of the Russian Embassy in Baghdad. Protesters supporting al-Sadr have been gathering outside the Green Zone since March 18, taking part in sit-ins. Al-Sadr wants Prime Minister Haider al-Abadi to replace his cabinet with people from outside the party in order to tackle rampant corruption. Joaquin Flores from the Independent Journalists Association for Peace spoke to RT and said that Abadi finds himself in a difficult position in trying to appease different groups, who have a diverse range of goals. “He is between a rock and a hard place. Any concessions he makes will show signs of weakness. On the other hand, continuing the line that he is on will ultimately undermine his authority,” he said. Abadi was expected to announce five new members on Saturday, but the session was eventually postponed, which was the catalyst for the subsequent violence.